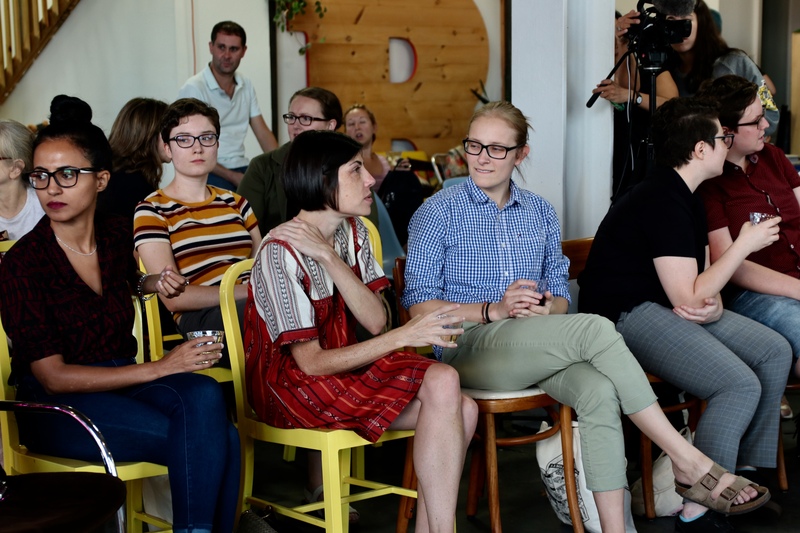 GOWANUS – Four women, all running as progressive candidates for elected office in New York met at a panel in Small City, a co-working space in Gowanus, to discuss reproductive health, education, women empowerment in politics, and what smashing the status quo means to them. 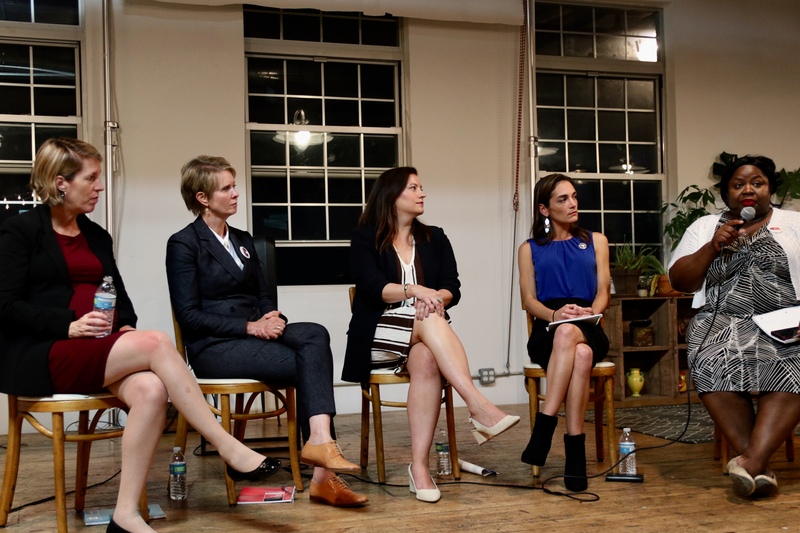 Cynthia Nixon (looking to unseat Governor Andrew Cuomo), Julia Salazar (running for State Senate in District 18), Zephyr Teachout (running for Attorney General), and Jasmine “Jasi” Robinson (challenging State Senator Diane Savino in District 23) answered questions from the audience and moderator Kelly Baden, Director for Reproductive Rights at the State Innovation Exchange. Yesterday’s panel was put together by Women’s Health and Reproductive Rights (WHARR), Persist81, and Indivisible Nation BK. “The status quo sounds non-threatening but it’s really the continuation of the oppression of women, poor people, minorities in our state,” Amy Bettys, co-chair of WHARR said introducing the women. As of March 2018, over 575 women had declared their candidacies for the House of Representatives, Senate, or Governor, more than ever before. 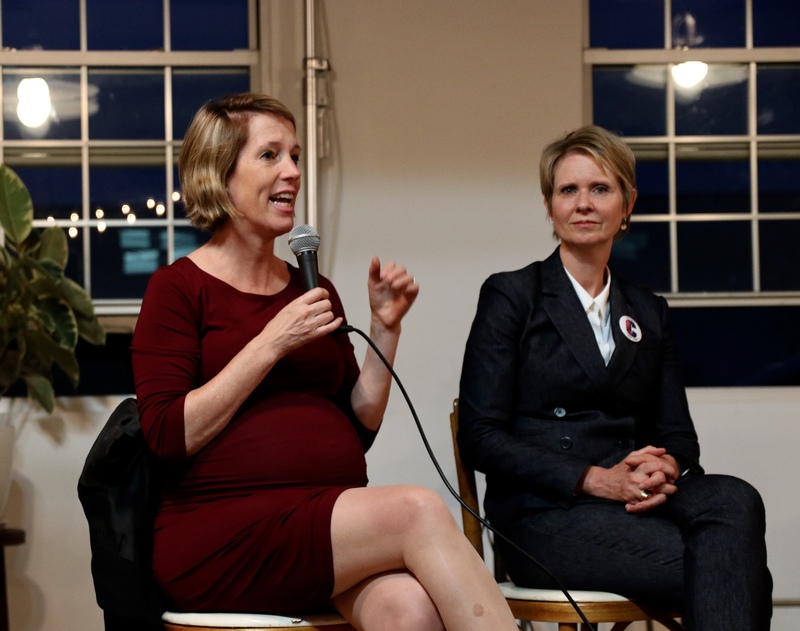 “After the financial crisis, I remember so many of the people who spoke up, whether Sheila Bair, Elizabeth Warren, the whistleblowers, the truth-tellers, were women who for various different reasons were so used to having to stand up and fight back,” Teachout said. Salazar also applauded the women and said it was “deeply inspiring” for her. “What we are doing this year with so many inspiring candidates… is establishing a new model so that young people will see women of color and identify us as leaders,” she said. Robinson decided to run for office after attending Erica Garner’s vigil. At the vigil, she saw people crying and saying elected officials don’t care about them, that they don’t matter, and don’t have a voice. Robinson decided to prove otherwise. The Reproductive Health Act (Senate Bill S2796) passed the Assembly in March of 2018. It was then blocked by the Senate Health Committee preventing it from going to the floor for voting. Roe V. Wade was never codified into law, which is why passing Senate Bill S2796 is very important to ensure women’s reproductive rights. Salazar was under heat last week when it was found that as president of Columbia Right to Life, a pro-life group in college, she fought against abortion services for students at Columbia University, Gothamist reported. At the panel, Salazar defended herself by saying she was miseducated about abortion. 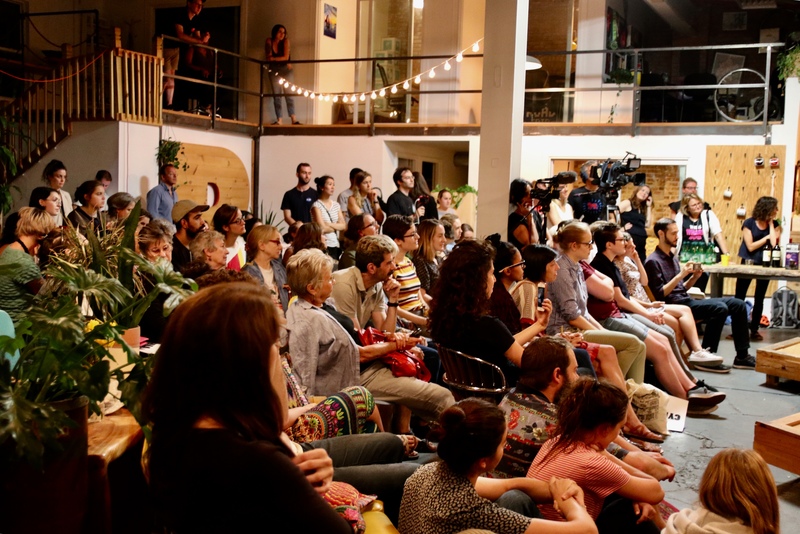 “I grew up in a very politically conservative, working class, immigrant family,” she said. She heard misogynistic arguments like it was always the woman’s fault for seeking an abortion. But when she went to college, she eventually “received a comprehensive political education” where she learned that what she knew about abortion was wrong. Robinson spoke about the importance of access to quality health care, especially for black women who are dying at alarming rates while pregnant. She believes that for any woman, whether she’s black, white, or undocumented, access to safe abortion is necessary. Education is a huge platform for Nixon. New York spends more than any other state on education, “which is a fact that Governor Cuomo loves to wave like a flag on the Fourth of July,” Nixon said. Aside from everything being expensive in NY, Nixon said NY simply spends a lot of money in wealthy school districts. She said she began protesting when her eldest son entered kindergarten and there were citywide budget cuts. Primary Elections are on Thursday, September 13 and all four candidates will be on the ballot.